Honesty is the best policy and size really doesn’t matter. 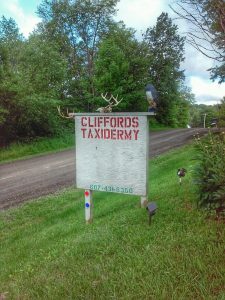 Cliffords Taxidermy is a one man operation and has been for 20 years. Cliffords work space is roughly 220 square feet. The facts are this, when you bring your trophy of a lifetime to Cliffords, your trophy will receive the utmost care and attention to detail any taxidermist can provide. Clifford’s mammal taxidermy experience ranges anywhere from a chipmunk to a black bear. Cliffords fish taxidermy ranges from a six inch bluegill all the way to forty plus inches Atlantic Ocean Striper Bass. Cliffords bird taxidermy ranges from a pigeon to a full strutting tom turkey. If you’re just looking to have an animal hide preserved by tanning it, Cliffords Taxidermy does that too. No matter where you live in North America, Cliffords Taxidermy can accommodate you. Cliffords accept trophy shipments of any and all species legally obtained. Proper permits and licenses are required when shipping to Cliffords Taxidermy. Cliffords will also return ship any and all finished mounts at the customer’s request.